Unified Inbox (www.unifiedinbox.com), the social conversation and collaboration platform, today announced that it has entered into a definitive agreement to acquire HelloInbox, the app to check and send all your email and social network messages on your iPhone, for an undisclosed sum. "We are excited to welcome HelloInbox to our family", said Toby Rueckert, Founder and Chief Executive Officer of Unified Inbox. "The HelloInbox team and in particular Dirk is as dedicated to streamlining multi-channel communication as we are, and we are looking forward to leveraging their expertise in the mobile application space to enrich the Unified Inbox experience. Nowadays Internet services must have a strong mobile strategy, and the knowledge and experience of HelloInbox is exactly what we need in the mobile arena." "We are very happy to have joined Unified Inbox", said Dirk de Kok, Co-founder and Chief Executive Officer of HelloInbox, who will be joining Unified Inbox's mobile strategy team. Message overload is becoming a bigger and bigger problem, users expect to be able to check and respond to all their messages everywhere all the time. Talking to Unified Inbox over a period of time we realized that our mobile apps combined with the strength of the Unified Inbox platform could deliver a world-class product. We look forward to contributing our mobile expertise in ways that delight consumers and business users alike." "We have a strong value proposition with the world's first unified inbox across devices and platforms including the web, tablets and mobile phones. Inboxes more and more become intelligence hubs where the mobile experience is key to both private and professional of users", said Markus Lehnert, Co-founder and Chief Financial Officer of Unified Inbox. "The combination of Unified Inbox and HelloInbox will give us an even better mobile expertise to become the premier independent communication and collaboration provider of choice." By enabling Unified Inbox to deliver a great mobile experience for users and businesses, the acquisition supports the Company's focus on continuing to enhance the way users communicate via various online channels. Unified Inbox has recently released their platform in beta to a large group of consumers and businesses, and expects to launch publicly later this year. 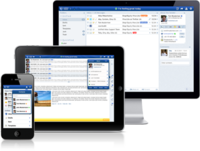 Unified Inbox is a cloud based unified conversation & social collaboration platform that centralizes external conversations, social engagement and internal team collaboration into one single platform across desktop and mobile devices. Unified Inbox enables employees to respond faster, more efficiently and build better business relationships improving your ability to connect with prospects, customers and other internal departments across multiple channels and devices from one single place. The company is headquartered in New Zealand with operations in Germany, France, United Kingdom, India, and Singapore.